An unnamed silver Compass and Square Past Master's suspended neck Jewel. The Jewel comprises of a normal Compass and Square, which is silver, with a fixed "G". and below the said badge is the motto of the Connaught Rangers, "Quis Separabit" (Who will separate [us]), which has two sprigs of four green enamelled shamrocks at either end and below the motto the name of the Lodge "The Emerald Isle Lodge No. XIX". Short History of Warrant No. 19. The Brethren of Lodge 19 commenced their Masonic careers under the Warrant No. 21 on the 10th October, 1733. However some time prior to 1735 Warrant no. 19 issued to brethren in exchange for Warrant No. 21, and met at "The Royal Billiard Table" in YOUGHALL, Co. Cork. Warrant No. 19 was cancelled in on the 7th January, 1830 as a result of neglecting to reply to repeated requests by the Grand Lodge for dues many years in arrears. Warrant No. 19 reissued to brethren in BALLYCASTLE, County Antrim, on the 7th October ,1830 in lieu of Warrant No. 87. Warrant No. 19 was suspended on 6th August, 1840 but quickly Restored on 12th December, 1840. Warrant No. 19 was never applied for and subsequently cancelled in 1891. The 1st Battalion of the Connaught Rangers, formerly the 88th Foot was, in 1905, stationed in Mullingar, where several of the Regiment were members of Leinster Lodge No. 131. The idea of forming a Lodge within the Regiment was mooted and taken up so enthusiastically that a fund was started to raise sufficient money to apply for a Warrant and to cover the initial cost of furniture and regalia. "Read memorial from Bros. Keely, Chamier, Chichester and 13 others praying for a Warrant to establish a Lodge in 1st Connaught Rangers. Recommended by Lodges 131,124 and 76. Fee enclosed. The Board recommended the issue of a Warrant to the applicants, Isaac Egber Keely, Band Master (131); Henry D. Chamier, Lt. Colonel, (131) and Arthur G.V. Chichester, Major, (5) registered along with eight others all from Lodge No. 131, to be numbered 19, notwithstanding that the WM. is at present in the Chair of Lodge Mullingar No. 131 and the SW not fully five years a MM." The Minutes of 7th March, 1907 show that Grand Lodge followed the recommendation The Grand Lodge Board of General Purposes and Warrant No. 19 issued The 1st Battalion, Connaught Rangers 88th Foot on 12th March 1907 under the seal of the Grand Master, the Duke of Abercorn. As arrangements for the Consecration of the Lodge were being considered the Battalion received orders to move to Malta, the beginning of an overseas tour which in those days would have involved some six years abroad. After arrival in Malta no time was lost and with the consent of the Grand Masters of the English and Irish Constitutions the new Lodge was consecrated in the Masonic Hall, Senglea, on the 22nd April, 1907 under the direction of the District Grand Master of the English Constitution, R.W. Bro. Col. H.T. Hughes-Hallett. W. Bro. Bandmaster I.E. Keely was installed as the first W.M., with Lt. Col. H.D. Chamier, Commanding Officer of the Battalion as S.W. and Majoy A.G.V. Chichester as J.W. Lodge did not make a return regarding service in the 1914 -18 War. A total of 106 brethren registered up to 27th January, 1919. In most cases the dates when the issue of certificates is shown, together with the rank or occupation of the brother. "3 February, 1919 – Read charge against Lodge 19 of having elected the Officers for 1919 irregularly. The Board directs the Warrant to be temporarily withdrawn in order to ascertain who are the proper custodians". This situation arose apparently from the election of Lt. Col. Fenton as W.M. although not a Past Warden. W. Bro. Keely reported the circumstances to Grand Lodge with the result that the Warrant was withdrawn and the Minutes of the G.L. Board of G.P. of 2nd June, 1919 show – Read letter from Lodge 19 Connaught Rangers returning the Warrant. To be retained until it is ascertained to whom it should be handed over. On request of the former regular members of Lodge 19 the Warrant, Minute and Attendance Books were returned to W. Bro. Keely who took the Chair again in later in 1919. Events after the War led quickly to the partition of Ireland and the disbandment of Irish Regiments, including the Connaught Rangers. This might well have entailed dissolution of the Lodge but an effort was made to preserve it. "Read letter from Lodge 19, Connaught Rangers for permission to transfer the Warrant from the Regiment to Ambala, India as a permanent place of meeting and to retain the title "Connaught Rangers" As there is no likelihood of the lodge being retained in the Regiment. the Board recommended the change but cannot recommend the title". It is shown in the Grand Lodge Minute of 4 March 1920 that this recommendation was followed and Warrant No.19 was transferred to AMBALA, India, 4th March, 1920. A letter was received from the Brethren of Lodge No. 19, which is refered to in the minute of the G.L. Board of G.P. dated 5th July, 1919 regarding a suggestion as to change of meeting place from Ambola to Dehra Doon. This was recommended by the board and permission granted by Grand Lodge. "5 July, 1920 – Read letter as to name of Lodge and place of meeting. – The Board cannot recommend the use of either of the names “Connaught” or “Rangers” nor any alternative place of meeting as suggested". Irish Masonic Records shows - Removed to DEHRA DOON, 1st February, 1921. Registrations continue with Isaac E. Keely, Captain, registered along with 37 others but no date shown, presumably being previously registered and in any case Issac E.Keely was one of the original Grantees. Register shows the Lodge to be working at Dehra Doon. "31 January, 1921 – Suggested Name of Lodge – “Emerald Isle” approved". "2 May, 1921 – Dehra Doon. Lodge submitted a design for a Chain Collar for W.M. – Approved". Irish Masonic Records [Philip Crossle] shows - Removed to LAHORE, India, (Pakistan from 1947) 5th April 1922. Series five Vol. 17 shown as Vol. 1 of the extant Grand Lodge Registers shows:- Warrant No. 19 to Lahore, Punjab as “Emerald Isle Lodge” The Register commences with a list of fourteen brethren from various lodges and constitutions affiliating to the lodge, certificates are all dated 26th August 1924. This is followed by the registration of Walter L. Kirby, Secretary, registered 7 June, 1924. A further 68 brethren registered up to 28th August, 1924. In most cases the dates when the issue of certificates is shown, together with the occupation of the brother. A total of 133 brethren registered up to 15th April, 1950. In most cases the dates when the issue of certificates is shown, together with the occupation of the brother. There are many affiliations shown during this period, mainly from English Constitution lodges. Series six Vol. 21 of the extant Grand Lodge Registers shows:-Warrant No. 19 to Lahore, Punjab as “Emerald Isle Lodge”. The Register commences with the registration of Thomas Simpson, Manager, registered 19 April, 1952. A total of 92 brethren registered up to 15th June, 1983. In most cases the dates when the issue of certificates is shown, together with the occupation of the brother. The Register shows a great many brethren affiliating to this lodge from other Constitutions. "The Board considered and granted a request from Lodge No. 19, Lahore to remove the Warrant to Dublin". "The Board having sanctioned the removal of the Warrant of Lodge No. 19, Lahore, to Dublin, in February, 1992, and the original Warrant being irretrievably held in the confiscated Masonic premises in Lahore, the Board sanctioned the issue of a duplicate Warrant under the Provisions of Grand Lodge Law No. 110". "3 October, 1992 – Emerald Isle Lodge No. 19, Lahore, having had its warrant removed from thence to Dublin, and the original Warrant being unavailable in the sequestered Masonic Hall in Lahore, the Board recommend that Grand Lodge approve the issue of a duplicate Warrant. – Confirmed"
Duplicate Warrant issued 3rd October, 1992. Lodge 19 was revived in Freemasons Hall, Molesworth Street, DUBLIN on 27th April 1993. Lodge was removed to Dublin to keep the Warrant extant pending its return to Lahore when the proscription on Freemasonry may be lifted. To facilitate Brethren from Pakistan who were in England on Masonic business, the then Wor. Master, Michael W. Walker (The Grand Secretary), surrendered the Chair to allow V.W. Bro. M........ M........ Honorary Past Grand Deacon, to act as Installing Officer and install V.W. Bro. Michael J. Ward, Grand Secretary of Instruction, in the Chair for the ensuing year. The fact that the Lodge is now working in Ireland allows some former members to attend. Pending the return of the Warrant to Pakistan interested Brethren keep the Warrant of "Emerald Isle" Lodge No.19 current waiting for the day it can be returned Home. In 1907, Lodge XIX was constituted with a travelling warrant to be the Masonic Lodge of the 88th Connaught Rangers Regt. From the start it had an eventful history. Preparations for its birth were carefully nurtured in Leinster Lodge 131, under the guidance of Bandmaster Keely, in Mullingar as the Regiment was stationed there. The Warrant was granted in March 1907 but the Regiment was promptly ordered to India. It stopped in Malta for a year of acclimatisation before proceeding to India, and the Lodge was going in Malta in April 1907 by the English District Grand Master at the request of the GLI. Over the following years the Lodge met in several stations in India. When the Regiment was disbanded after the First World War, Grand Lodge allowed the Lodge to continue as a civil Lodge with a change of name and based in its current station. It thus became Emerald Isle Lodge No. XIX, Lahore. The Lodge survived the partition of India despite its members being both sides of the new border and soon it was initiating enthusiastic Pakistani members. Problems arose with the Government of Pakistan trying to restrict Freemasonry in the 1970s. Finally, the Martial Law administration of General Zia Ul-Haq tried to ban Freemasonry. When the Courts repeatedly found in favour of the Freemasons, the regime finally resorted to banning Freemasonry under a Martial Law Regulation and seized the fine Freemasons’ Hall in Lahore and the assets of Lodges in 1983. Emerald Isle XIX went into darkness, together with other Lodges of the English and Scottish and the case for allowing freedom of association as a basic human right is still being contested in the Lahore High Court over 30 years later. Early in the 1990s, the Lodge petitioned Grand Lodge for a duplicate warrant and permission to work in Ireland until such time as the light of Freemasonry could once more shine in the land of Pakistan. M.W. Bro. The Marquess of Donegall L.V.O. The GLI readily agreed, and Lord Donegall having just retired as Grand Master was very willing to take the Chair of King Solomon for the Lodge’s first ever time working in Ireland. This he did in recognition of the bravery of the Pakistani Brethren who had stood up in the courts to defend the honour and practice of Freemasonry. Thus the Lodge has found a home in Dublin since 1993, during which time our membership has grown to over 80, with Brethren living in 8 different countries and being adherents of five different faiths. The Lodge acknowledges the very generous and understanding support of Grand Lodge in this move, and values very much the wonderful support of Brethren here in Ireland, nearly all of whom are affiliates from other Lodges. During the time in Ireland, the Lodge has kept active in support of Pakistan, encouraging the Brethren there and supporting local charities. At the same time it has sought to explore and connect with its history in the Connaught Rangers as well as its roving years with a Travelling Warrant on the Indian sub-continent. The picture shows the old Masonic Hall in Lodge Road, Lahore, built in 1859. In the days of the Raj processions took place between the Hall and the Church on St. John’s Day. Rudyard Kipling was initiated in Lodge Hope & Perseverance No. 782 EC here in 1886. The Hall was damaged by the earthquake of 4th April 1905 and finally abandoned in 1917 when the new Masonic Hall was built, in which the Emerald Isle Lodge No. XIX met during its time in Lahore. "Buried by Zia, Freemasons now haunt Punjab Govt"
Freemasons' Hall, "Kothi Jadugar", Lahore, Pakistan. LAHORE - Top government officials in Punjab are perturbed over a legal move by the Freemasons that can ultimately result in the loss of prime property currently under the possession of the Punjab government, Pakistan Today learnt on Friday. The Freemasons, one of the most mysterious and controversial societies across the world, were banned in Pakistan by former president Ziaul Haq under the Martial Law Regulation (MLR) 56 in 1983, charging them of “anti-state” and “anti-Islam” activities and handing over their moveable and immoveable assets to provincial governments with immediate effect. In Punjab alone they possessed three prime properties: 90-The Mall (Lahore), 307 (Multan) and 1307 (Rawalpindi). At the time of partition, the estimated number of properties they possessed across Pakistan was around 30. However, what happened during Ziaul Haq’s regime was the epitome of a long going controversy starting in 1973 when the Punjab Assembly passed a resolution against Freemasons declaring their activities “anti-state” and “anti-Islam”. The federal government also took Punjab’s lead while Khan Abdul Qayum Khan, the interior minister at the time, declared them innocent. However, in 1973, the deputy commissioner of Lahore requisitioned 90-The Mall for the Islamic Summit for two months and the deputy inspector general (DIG) office was set up there as a makeshift arrangement, but the building was never returned even though the Lahore High Court (LHC) single and double bench decided in the Freemasons’ favour. The government then moved the Supreme Court against the LHC verdict in 1978. Finally, Ziaul Haq took over and imposed a ban on the Freemasons, while in 1986 the Supreme Court decided that the issue was no more as the MLR 56 had been given legal cover under the 8th Amendment in 1985 and told the Freemasons to appeal at a “proper forum” in case of any grievances. Since the term “proper forum” has not been defined in any law, the Freemasons wrote to various high offices such as successive presidents and prime ministers, including both Nawaz Sharif and the late Benazir Bhutto, but did not receive any reply. Finally in 1995, Freemason Kabir A Sheikh and five others filed a writ petition (8907/95) challenging the MLR 56, pleading that they were a philanthropist organisation while building their argument around the history and legal status of 90-The Mall, at the time under the use of Punjab Chief Minister Shahbaz Sharif. According to court records, Freemasons, all residents of the provincial capital, filed the writ petition through their counsel Dr Khalid Ranjha against the Punjab government, which was represented by the additional advocate general. During the course of the case, the Interior Ministry had also filed its comments on the issue saying that the available material showed the Freemasons were involved in “anti-state” and “anti-Islam” activities, to which Freemasons submitted an affidavit declaring that they practiced Islam as a religion and their beliefs were similar to common Muslims. Interestingly, however, the revenue records dating back to the 1950s and 1960s show the building now named 90-The Mall mentioned as “Kothi Jadugar” (Sorcerer’s House). The Freemasons had also won a case under the Corporation Act claiming the building in question had been declared a “temple”. Iran, Iraq and Saudi Arabia have also banned the organisation because of its controversial nature. Worldwide, Freemasons are famous for their secret rituals and for constructing buildings which supposedly have secret symbols inscribed into their architecture. Few other international organisations are surrounded by as much controversy as the Freemasons. There are 33 degrees of Freemasonry, while the ones who have filed the writ petition are ‘Masters’ and ‘Past Masters’, Freemasons of the 4th and 5th degree respectively. This has created a lot of anxiety among top government officials in the Punjab Civil Secretariat owing to the gravity of the situation as well as the mystery surrounding Freemasons, especially given that the next date of the hearing in the LHC is December 30. Many top officials have ordered books on Freemasonry from abroad to study their history and symbols and what they stand for, while a lot of rumours are making rounds in the corridors of power regarding the probable future of the prime offices under the possession of the Punjab government because if the court gives a verdict against the MLR 56, it would ultimately result in the Punjab government having to hand over all property back to the Freemasons. History of 1st Battalion, the Connaught Rangers, 88th Foot. one of the British Army's most celebrated Irish Regiments. 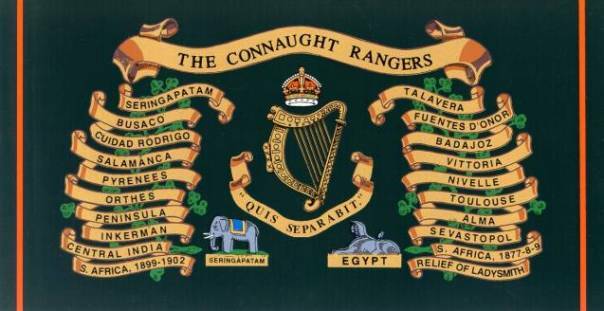 The Connaught Rangers were formed from two original regiments, The 88th. and The 94th. Regiments of Foot. Two regiments bore the number 88 until in 1793 a third was raised and became known as The Connaught Rangers. The first 88th. was the Royal Highland Volunteers, known as Campbell's Regiment, raised in 1760. The second was the 88th.Foot, known as Keating's Regiment, which was in existence from 1779 to 1783. The Connaught Rangers were, of course, raised in Ireland's Western Province of Connaught. Their badge from the time of their formation was the Irish Harp. The 88th. 's first Battle Honour was gained during the Egyptian Campaign, and the following additional Honours were gained during The Penisular War :- 'Talavera', 'Busaco', 'Fuentes D'Honor', 'Cuidad Rodrigo', 'Badajoz', 'Salamanca', 'Vittoria', 'Nivelle,' 'Ortez', 'Toulouse', and 'Peninsula'. The 88th. Regiment after The Peninsula War was stationed on the island of Corfu in 1834, and received new colours incorporating its Peninsula War Honours, from Lady Woodford, wife of Major-General Sir A. Woodford on 27th February 1834. The regiment served in The Mediterranean, The West Indies and North America until 1851, and after spending 3 years in England departed for active service in The Crimean War in 1854. During that campaign, The 88th. Regiment took part in the battles of Alma and Inkerman, and the siege of Sebastopol. It then returned to England for a brief time and then embarked for India. Before embarkation, during the troops' English sojourn, new colours were presented at a parade on Southsea Common in July 1857 by Sir William Codrington. The 88th. Regiment took part in the campaigns during The Indian Mutiny, and gained the Battle Honour "Central India" during that time. The Regiment did not return to England from India until 1870. It then saw active service in South Africa,during the Kaffir War from 1877 to 1878 and the Zulu War of 1879. For bravery in action on 29th December 1877 near Komgha, when he attempted to save the life of a member of the Frontier Armed Mounted Police, Major H.G. Moore of The 88th. was awarded The Victoria Cross. Details of his action can be found on The Victoria Cross Reference website. 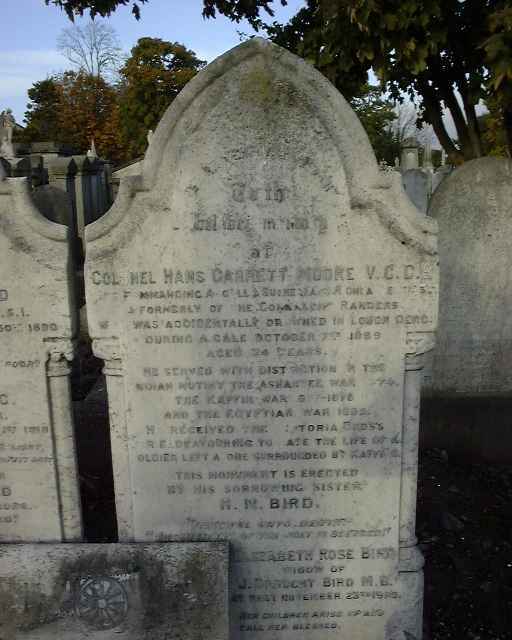 Grave of Captain and Brevet Major H G Moore, V.C. Following the campaigns in South Africa, the 88th. Regiment transferred back to India in 1879 and 1880 and remained there until 1891. At Mooltan in 1881, the 88th Regiment of Foot was re-named as the 1st. Battalion of The Connaught Rangers, and joined with the 94th.Regiment, which became the 2nd. Battalion. At Meerut in 1885, the Duchess of Connaught presented new colours to this Battalion of the new regiment. In 1891, the First Battalion of The Rangers returned from service in India, spent several years in England and then in 1899 went to South Africa as part of an Irish Brigade under the command of Major-General Hart. Casualties in The South African Campaign were heavy, and the First Battalion returned to Ireland to recuperate, re-train and recruit until 1908. In 1908, the First Battalion embarked for India. Shortly afterwards, the Second Battalion returned from its tour of duty on the Indian sub-continent to be stationed in Tipperary Town Barracks from 1908 to 1910. 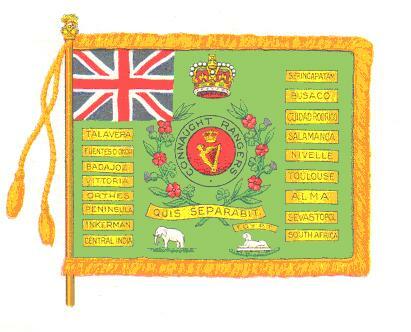 Both battalions of The Connaught Rangers received new colours from King George VI in 1911, the 1st.Battalion at that time being in Delhi, India, and the 2nd Battalion in Dublin, Ireland. From 1908 to 1910, the 94th. Regiment had been quartered in Tipperary Town Barracks, County Tipperary. 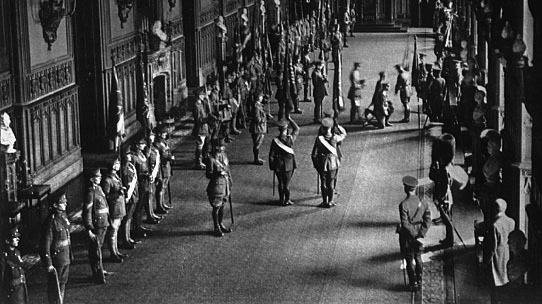 At the outbreak of The First World War in 1914, the 1st. Battalion of The Connaught Rangers was in India and the 2nd. Battalion was in Aldershot Barracks, Hampshire, England. The 1st. Battalion was recalled from India, and joined with the 2nd. at Le Touret, near Bethune. These two regular battalions of The Rangers served together for the entire 1914-1918 War. During that war, the Rangers' strength was supplemented by the 3rd. (Reserve) Battalion, the 4th. (Extra Reserve) Battalion and the 5th. & 6th. (Service) Battalions. After serving on The Western Front in France during 1914 and 1915, the 1st. and 2nd.Battalions in December 1915 embarked for The Middle East theatre of war, where they saw service in Palestine, Mesopotamia and Turkey. Their place on The Western Front was taken by the 6th. Battalion, which fought in France and Flanders (Belgium) until The Armistice in November 1918. In October 1916, Private Thomas Hughes of Carrickmacross, County Monoghan, was awarded The Victoria Cross for his action in single-handedly putting out of action an enemy machine gun and taking several prisoners. Details of his citation can be found on The Victoria Cross Reference website. The First World War Battle Honours of The Connaught Rangers are:- 'Mons', 'Retreat from Mons', 'Marne 1914', 'Aisne 1914', 'Messines 1914, 1917', 'Armentieres 1914', 'Ypres 1914, 1915, 1917', 'Festubert 1914', 'Givenchy 1914', Neuve Chapelle', 'St. Julien', 'Aubers', 'Loos', 'Somme 1916, 1918', 'Guillemont', 'Ginchy', 'Cambrai 1917, 1918', 'St.Quentin', 'Bapaume 1918', 'Hindenburg Line', 'Selle', 'France and Flanders 1914-1918', 'Kosturino', 'Struma', 'Macedonia 1915-1917', 'Sulva', 'Sari Bair', 'Scimitar Hill', 'Gallipoli 1915', 'Gaza', 'Megiddo', 'Sharon', 'Palestine 1917-1918', 'Tigris 1916', 'Kut al Amara 1817', 'Baghdad', 'Mesopotamia'. Outside military circles, the 'claim to fame' of The Connaught Rangers which is best-known worldwide is their singing of their favourite marching song "It's a Long Way to Tipperary". The 2nd. Battalion sang this song on 13 August 1914 as they marched in parade order through the streets of the French port of Boulogne on their way to The Front as part of The British Expeditionary Force. This incident was witnessed by War Correspondent George Curnock, and his report of it was printed in The Daily Mail Newspaper on 18th August, 1914. From that day, that music-hall song, written by Jack Judge in 1912, gained popularity amongst all the troops during The Great War and gave lasting fame to the town of Tipperary, Ireland. After World War I was over, both battalions of The Connaught Rangers returned to the Army Depot at Dover, Kent, England; where their numbers were made up to full strength once more. The 1st. Battalion then went to India in October 1919; and the 2nd. Battalion went to Upper Silesia (Poland) in May 1921. When news of the atrocities committed in Ireland by "The Black and Tans" reached the 1st. Battalion in Jullundur and Solan, India; a mutiny arose amongst the Irish troops and 69 men were court-martialled. At Solan, 2 mutineers died whilst attacking the armoury, and 14 were sentenced to death. However, only the ring-leader of this rebellion, Private J. Daly, was finally executed. No doubt the Army leadership realised the extreme provocation under which the rebellion was mounted by those Irishmen, hearing of the fate of their fellow-Irishmen at home at the hands of British soldiers of another regiment. Following the mutiny, the entire 1st. Battalion was sent to Rawalpindi and saw service there, with no further rebellion. In June 1922, both the 1st. and 2nd. Battalions returned to Britain. Their colours were then laid up at Windsor, Berkshire. The Connaught Rangers were disbanded as a regiment on 31 July 1922, after an outstanding record of uniformed military service over almost 230 years. The Rangers' links to Tipperary Town still exist, immortalised worldwide in the words and music of the song "It's a Long Way to Tipperary". The Colours being laid up at Windsor Castle. Details of when "Emerald Isle" Lodge No. XIX meets. "Emerald Isle" Lodge no. 19 meets on the 1st Tuesday in 4 and 9 at 6.30p.m. At Freemasons’ Hall, 17 Molesworth street, Dublin 2.